Our Monthly luncheons will be held the 3rd Tuesday of the month at the Towne Center City Club, 222 Central Park Avenue, Suite 230, in Virginia Beach with registration/networking at 11:30am and our Program/Lunch from noon to 1:00pm. Please mark you calendar and plan to join us. Pop Up Breakfast Session: Things You’re Afraid to Ask Your Boss! Click Here to Register by 5pm on Thursday, February 14, 2019. 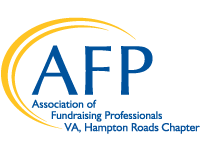 Membership Social- "Cocktails with a Cause"
Please join our AFP-HR Board of Directors, for a membership social to ring in 2018! AFP is offering a special member benefit at the May luncheon. We’ll have a professional photographer available to take member headshots. You can use this headshot in your LinkedIn profile, on your company website, or for other social media and publications. You must prepay and sign up for a slot: 11:00am-12:00pm or 1:00pm-2:00pm. A limited number of slots are available, so register today!